Here's one event I wished had when I was pregnant! 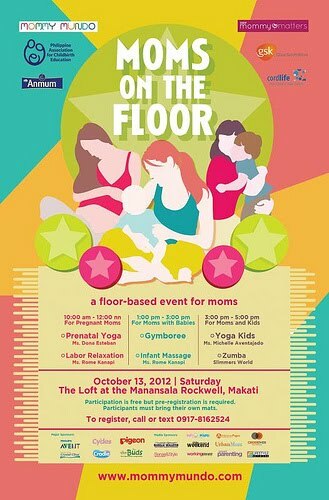 Don't fret because moms with babies and bigger kids can still attend this very fun event! MOMS! Getting "ON THE FLOOR" means 1) Fitness, 2) Bonding and 3) Fun! Join us on October 13, 2012, Saturday at The LOFT, Manansala Tower, Rockwell, Makati. There's limited slots per portion so register now! This event is free but pre-registration is a must. You can bring your partner/husband, just make sure to register them also! For event updates, JOIN the event page on Facebook. Click here. Moms on the Floor is co-presented by Shop Mommy Matters, GlaxoSmithKline, Anmum, and Cordlife CordBlood Banking, supported by Cradle, Philips Avent, Pigeon, Tiny Buds, Crystal Clear, and media partners Manila Bulletin, Working Mom Magazine, Smartparenting Magazine, Baby on Board, Urban Mom Magazine, Mommy Pages, Crossover 105.1 and the Lifestyle Network.